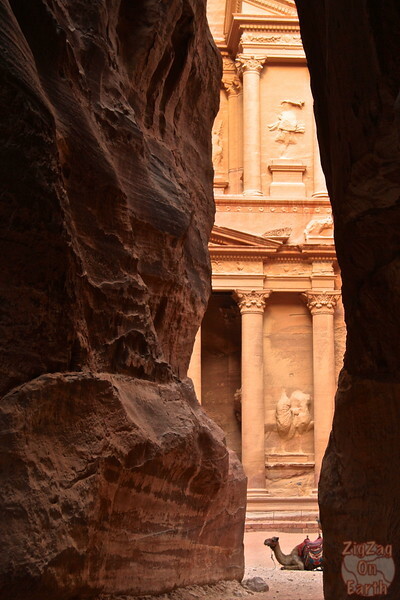 The Main entrance to the hidden city of Petra goes through the impressive split in the rock called The Siq Petra. 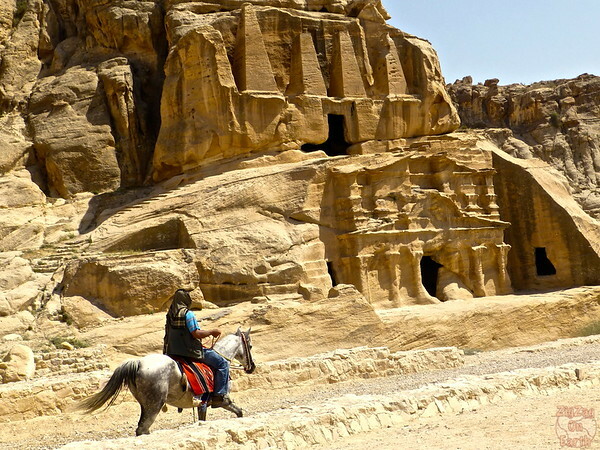 My plan was set, all my research done: I wanted to be at the entrance of Petra at 6am, opening time and enjoy the long walk through the Siq in the peace and quiet that early riser get. And I did not regret it! 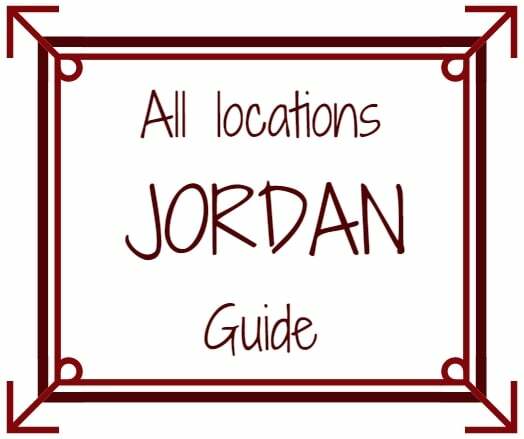 Before I share some incredible pictures of the walk, here are some tips to help you plan your trip. 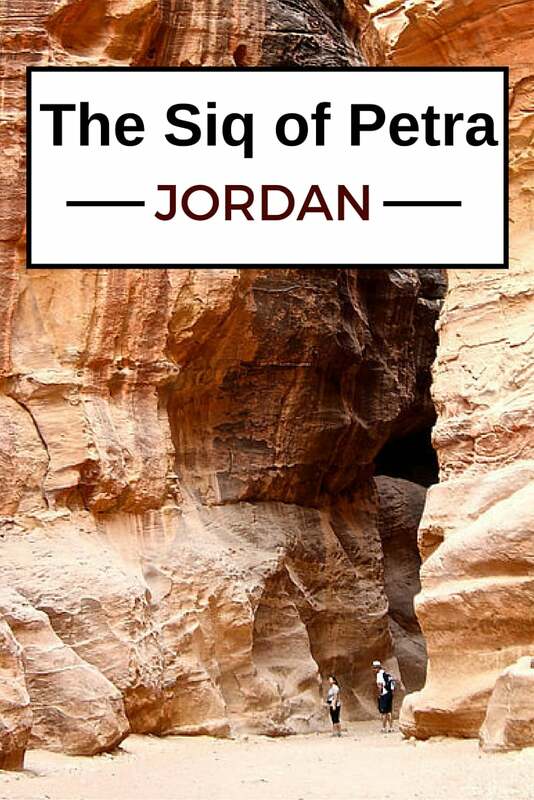 How to get to the Siq Petra? 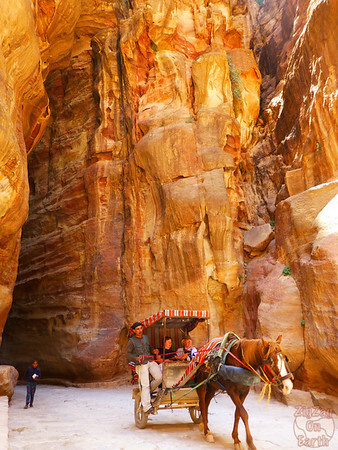 Right after passing through the Petra Gate, you first walk in a large gorge and past a few monuments until you reach the amazing entrance to the Siq. If you want to really enjoy it, get in at opening hours to feel the silence and discover the Treasury at the end almost by yourself. It is quite a magical moment! 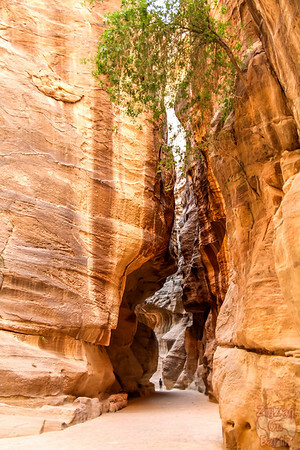 From the visitor center, you walk in a large gorge with a few monuments such as the Obelisk tomb, but I was so excited to enter the Siq that I did not stop. 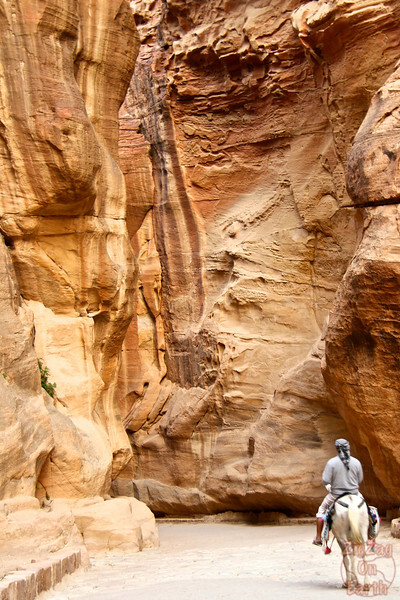 And I knew I would have time on my return walking slowly tired after a long day around Petra. Along the way you can admire the natural curves and the fascinating colors of the rock. This is quite a longer walk that one would expect (over one km) but every minute is a pleasure for the eyes. At that time I could walk alone in this quiet environment and take it all in. The other advantage was that all the kids and carriage drivers were not yet there and did not bother me. 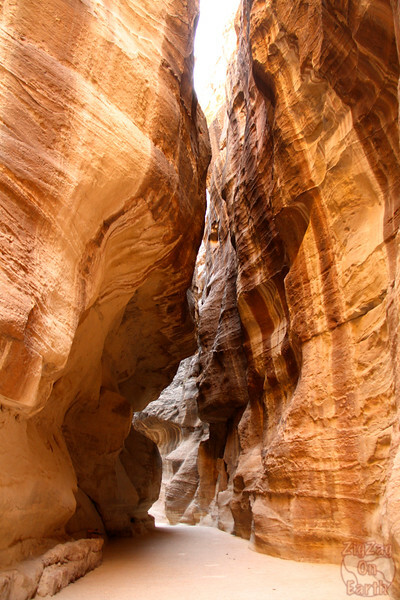 The gorge is 1.2 kilometers long. At its narrowest point the walls are only 3 meters apart! When I tell you it is impressive, I am not kidding: the walls on both side of you are 91 to 180 meters in height (300 to 600ft roughly)!!!! It is a unique experience. And at the end of the Siq... the Treasury! Just walking the Siq is worth a visit to Petra, but so much more is waiting for you... And you know it, so at every curve you wonder if you are going to spot the magnificent ruins of Al-Kazneh alias The Treasury. Getting theglimpse of the Treasury is a reaveal that you anticipate the whole walk. And it does not disappoint! During the day, the carriage going up and down will make the experience a bit less magical. Pay attention! 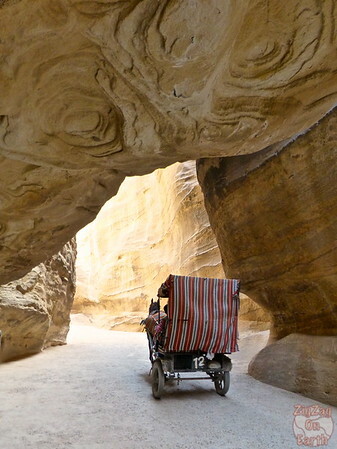 You have to remember that the Siq and the path from the Siq to the visitor entrance are not flat. 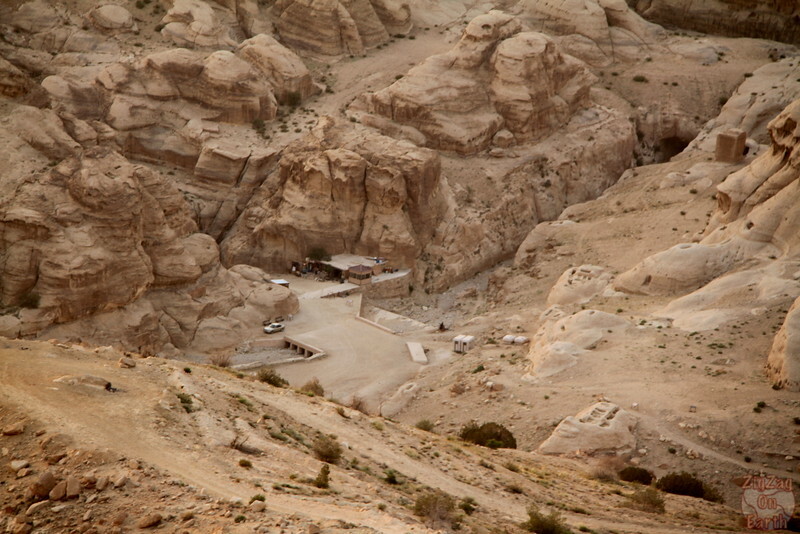 I had read a lot of reviews with people warning us that the return would be tiring especially after a full day walking. On my way in I absolutely did not realized I was going down; however I really felt the climbing part to return to the entrance!!! So be aware, paying a bit more for a horse or a carriage can be a good idea. 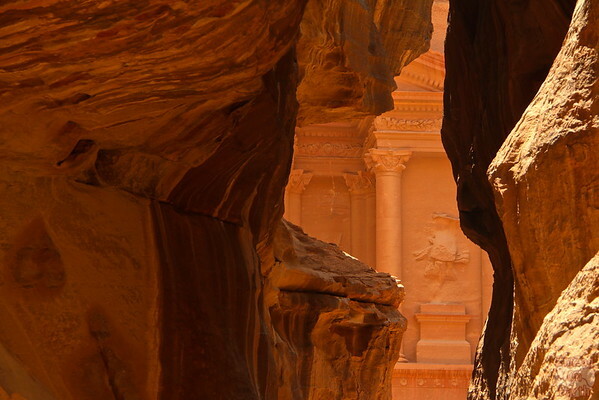 I was in Jordan several years ago and can easily say that Petra is one of the most spectacular sights I’ve ever come across. 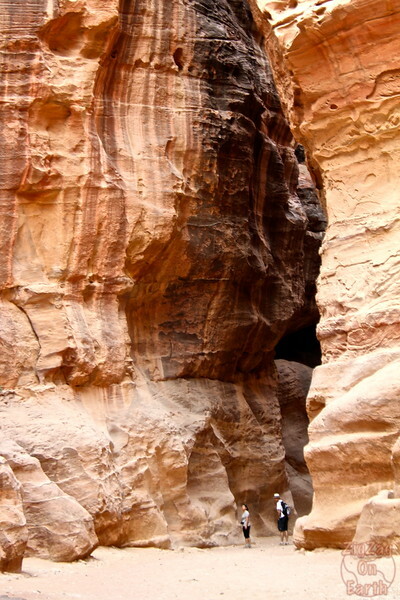 The meandering entry down the narrow crevasse, the Treasury and Monastery built right into the stone, the Bedouin with their stories and the tea shops in the shade. Your pictures bring back such wonderful memories! I am glad you enjoyed them. I try studying pictures of Petra before going to get some ideas on how to take them, but is is very difficult due to the proportions, the light, and the fact that I am just an amateur. Writing this blog makes me relive my travels, I am really enjoying it and I am happy it brought back your memories.